Close to Cowley Rd cafes and shops, in a prominent location, with light spaces, original wooden floors, and a changing exhibtions. Perfect for meetings, classes, arts activities, gigs and evening events. The studio measures 28x27ft. With a small kitchen area, 6 trestle tables and 40+ chairs for use. Rooms rates are between £12-18 per hour dependant on the type hire. Reduced rate day and multiple day room hire rates are available. We also provide hire for gigs, including PA system. Studio 1 can also be hired for exhibtions, these run for two week periods. The hire fee is £100, with a 20% commssion rate. Exhibtion hire includes a two hour private view. Viewing times are dependant on the activity in the centre, please contact us for further information. 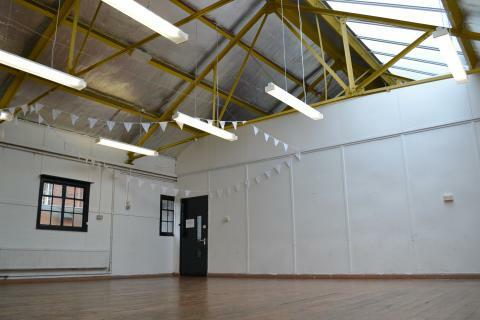 We provide equipment hire for artist workshops. Please contact us for further information about equipment and prices.